Every Thursday, the monuments on Al-Khalifa Street in Cairo's Al-Saida Zeinab district are filled with the neighbourhood children, as part of the Al-Athar Lina project. Historic monuments open their doors to children who paint, create replicas and mini plays as well as treasure hunts on themes derived from the social history of the monument. Their art work combined will create a miniature replica of the Ibn Tulun Mosque. Al-Athar Lina, (The Monument is Ours) is a participatory design project for Monument-Street Buffer Zones (safe zones surrounding the monument to ensure its security) in Al-Khalifa Street, which runs between Ahmed Ibn Tulun Mosque in Al-Saida Zeinab popular district and the Shrine of Al-Saida Nafisa. The project is a result of collaboration between the Ministry of Antiquities and the Danish Egyptian Dialogue Institute to promote among the residents a sense of ownership and belonging towards the monuments in their neighbourhood. The idea is the brainchild of May Al-Ibrashy, a restoration architect, director of the project and board chair of Mogawra (Built Environment collective) NGO. "I work in restoration and stopped for a while because I had some concerns on the way we worked," explained Al-Ibrashy. "Because focusing on the building alone will not cut it, for people do not use it. No one cares about it, hence the building will go back to its old status if not worse in ten years time," she lamented. Al-Ibrashy added that the main problem is the neighbours' lack of building ownership because of the governmental policies that tend to shut down and fence any restored site. "We even prohibit the neighbours from building anything in the buffer zone of the monument. [There are] restrictions, like certain height [limits], on any new buildings in the neighbourhood, which are valid procedures. Yet, have left the people out of the bigger picture," argued Al-Ibrashy. The aim was to promote a dialogue other than mere awareness. The idea was to learn from the people. They picked Al-Khalifa Street because this street has a huge batch of antiquities. It also serves as one of the worst examples of the buffer zones, which turned from the only green recreational area, after being fenced, into a centre point for garbage collection. "If that was somebody’s house or shop they would have objected," she noted. Moreover, the street documents lots of unfinished restoration initiatives that started in the nineties and came to an abrupt end. 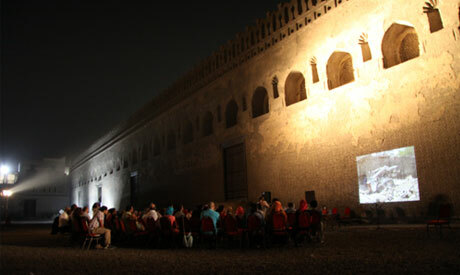 The organisers started by asking the residents how to best make use of the buffering zone of Ibn Tulun Mosque, as a way of involving them. "We started last June with three workshops and talked to all stakeholders from the Ministry of Antiquities to the Ministry of Education as well as tourism. We picked a problem, switched roles and asked the residence to [help] solve it and so on." Team building helped all parties get rid of the defence mechanisms and blaming each other, Al-Ibrashy said. "One of the main concerns of the residence was qubat shagret al dor, which is an incomplete building that was initially designed to be a mosque but was never completed. At some point, it served as a local clinic, but was shut down. We are currently working on restoring the monument and re-opening the medical centre. Hopefully, we will use the rest of the building as a community centre." After the first phase ended, the project continued due to voluntary efforts under the umbrella of Mogawra NGO. The shift was also directed towards the children of the neighbourhood. The neighbourhood elementary school around the street opened its doors to the cultural and artistic activities that aim to promote a sense of ownership and belonging of the monuments among the children. Hence, every Thursday, the school children are taken on a field trip to one of the enchanting monuments in their neighbourhood. they would paint, create replicas and mini plays as well as treasure hunts on themes derived from the social history of the monument. Their art work combined will create a miniature replica of the Ibn Tulun Mosque.